Three days after his 46th birthday, hubby treated us to dinner at Pagliacci, an Italian restaurant, at The Podium. We first dined at Pagliacci two years ago, and we enjoyed the pizza and pasta we ordered back then. Hubby absolutely loves Pagliacci’s Nero di Seppia! According to him, this spaghetti with squid ink sauce, slices of tender squid and cream was delicious. He enjoyed it so much that he wasn’t bothered at all by the stain it leaves on his lips and teeth. Lol! I will never get tired of eating Tavolara. 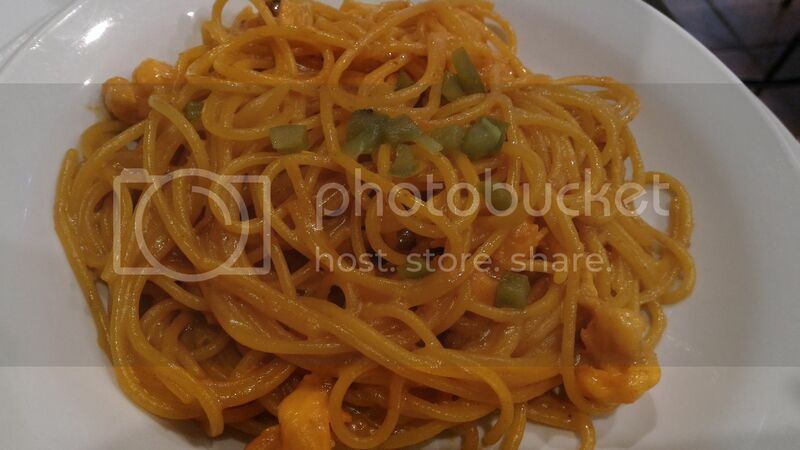 This is spaghetti with crab fat sauce, shrimps, garlic, cream, olive oil and roasted bell peppers. Sinful, yes, but oh, so good! 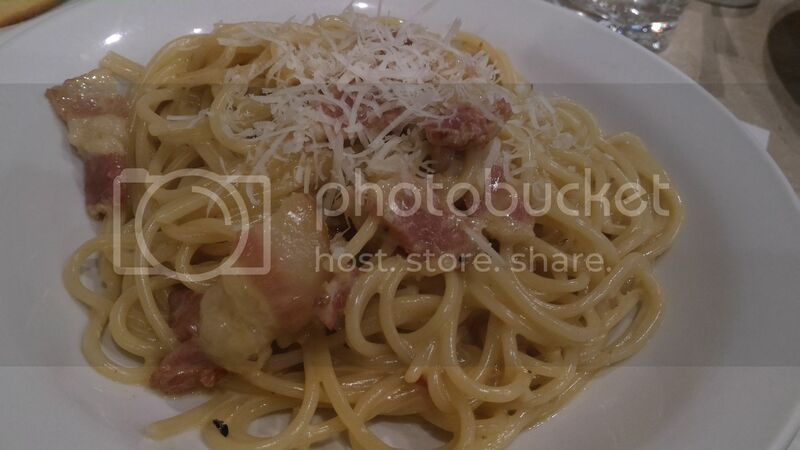 Carbonara is not included in Pagliacci’s menu, but they accommodated our son’s request for his favorite pasta dish. This cheesy, creamy and tasty bacon carbonara received a thumbs-up from our son. He ate it with gusto and finished his entire plate in no time. 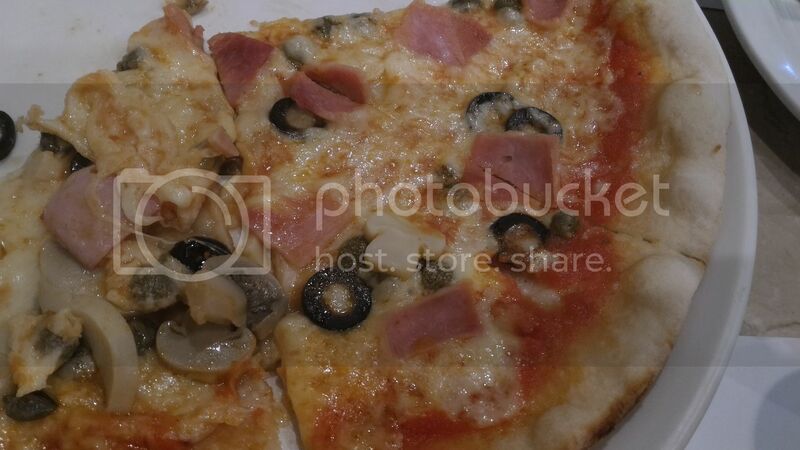 Capricciosa is a thin-crust pizza with ham, mozzarella cheese, black olives, capers, mushrooms and tomato sauce. Our son had two slices of this pizza minus all the veggies. This was okay, but we like Pagliacci’s Ai 4 Formaggi (4-Cheese Pizza) better. It was another hearty family dinner for us at Pagliacci. We super love their al dente pasta and the fresh ingredients they use in their dishes. We also enjoyed their complimentary focaccia bread with tomato salsa and roasted eggplant dips. This entry was posted in Birthday Celebration, Pagliacci, The Podium. Bookmark the permalink. I would love to try that Squid ink pasta! It sure looks interesting. The other pastas look just as lovely. Glad you enjoyed the dishes you ordered! Pizza and pasta! Yum! Looks like it was a great celebration! akala ko post birthday mo eh later part of January ka pa.. The pizza looks good and yummy ha..
Makes me think of Corazon’s paella negra. And I so love the Tavolara. Kakagutom tuloy. Ihihihi. We love pizza and pasta! We definitely have to try this resto the next time we find ourselves at the Podium. Happy Birthday! 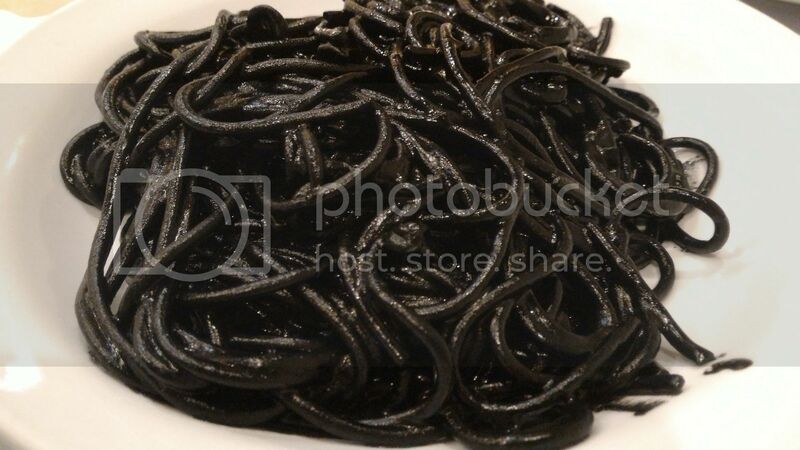 The black pasta looks interesting to try. It seems awkward heheh but if its really delicious then it is worth to try. Thanks for sharing! The Tavolara looks sinful… but I want to try it! I haven’t tried Nero de Seppia ever.I wonder how it tastes like. I’m not really a fan of the squid ink pasta, but their carbonara looks extra yummy! Squid ink pasta is looove! I also love paella negra. Belated happy birthday to your husband! Haven’t tried eating there. Will check it out sa Posium, that black squid pasta looks interesting. I have not seen this restaurant in Podium. The food looks good so I will definitely check this one when I visit the mall again. Omigosh squid ink pasta is LOVE! Now I’m craving for Italian food.